The first thing you should do is assess what you have growing in containers. What you can retain or replant depends on its hardiness for North Texas weather. Here’s a useful guide to get you started. Evergreens – these winter hardy plant can remain in their container. Small trees & shrubs – if they are suitable to withstand the cold weather keep them in their containers; if you believe them to be too tender you can relocate the pots to a sunny indoor location. Perennials – you can either replant perennials in a garden bed (before the first heavy frost) or move the containers close to a structure that will give them some winter protection. Ornamental grasses – these tough growers can stay in their containers until they moved through their fall cycle; then cut then back to around 4” and leave in containers or move to your landscape. Vines – cold weather hardy varieties can stay in containers but tender ones need to come indoors; if they’re annual vines (like sweet potato) add them to the compost. Succulents – a select few succulents will survive winter climate; check with a landscape professional if in doubt or act on the side of caution and bring them indoors. If you have containers with a mix of evergreens and annuals, pull out the annuals leaving evergreens in place. If you don’t care for the bare look, fill in with smaller winter hardy shrubs. If you prefer more pops of color, a cool weather plant like the pansy should survive until a harsh cold spell and then hopefully pop back up in early spring. Conifers growing in containers – such as cypress, spruce, fir or juniper – will need a bit of TLC to remain looking lovely through winter. First move the pot to a location that will get decent winter light and rotate the container if the plant is growing too far in one direction. These plants may shed a bit of their foliage, so prune as needed to make them more attractive. Spruce up (pun intended) the base of the container with a variety of pine cones or even some other variety of conifers that will cascade down the side of the pot. If your containers have been home to perennials (plants that come back every spring), you have some choices to make. If you have only thought of them as something for one season, you can toss them. If you liked them but want something different in pots next year you can relocate them to an appropriate place in the garden based on their light requirements (i.e., sun or shade). 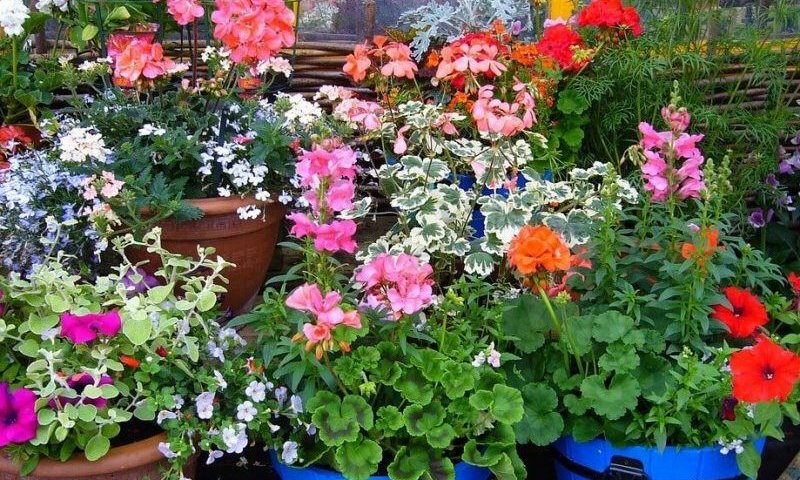 If you look forward to seeing them again in your container next spring, simply cut back the foliage and place pots to the back of the garden bed. If you experience a harsh winter, containers made of ceramic and terra-cotta materials can crack due to fluctuations in the temperature. If you want to ensure that they remain viable for another season, move them to a green house or garage, or at least a sheltered area near the warmth of your house. If the soil in the pots has been used for a couple of years it is probably depleted of necessary nutrients. In these instances, empty out the old soil then wash and let containers dry completely before storing away. Pots that are home to spring blooming bulbs (think daffodils and tulips) should be moved into a cool, dry location until spring. Metal and stone containers are probably safe from cracking but if they are moveable bring them to a sheltered spot. If some of your empty pots are particularly lovely and you want to keep them on display through the holidays, fill them with evergreen branches, small interesting tree limbs or dried berries. These holiday arrangements won’t require much attention but they will bring a cheery welcome to your front porch or a bright spot to the yard. The birds will appreciate a sweet place to hang out. Transitioning your containers to winter can be bitter sweet. It’s always hard to pull the plug at the end of the growing season because you will miss the beauty that has surrounded you for months. But the bright side is that you will be ready for spring and the promise of more loveliness to come.